A perfectly ripe pear and an avocado sitting next to each other in the fruit bowl provided the inspiration for this healthy week-end lunch. I’ve always liked the sweetness fresh fruit adds to an otherwise savoury salad. 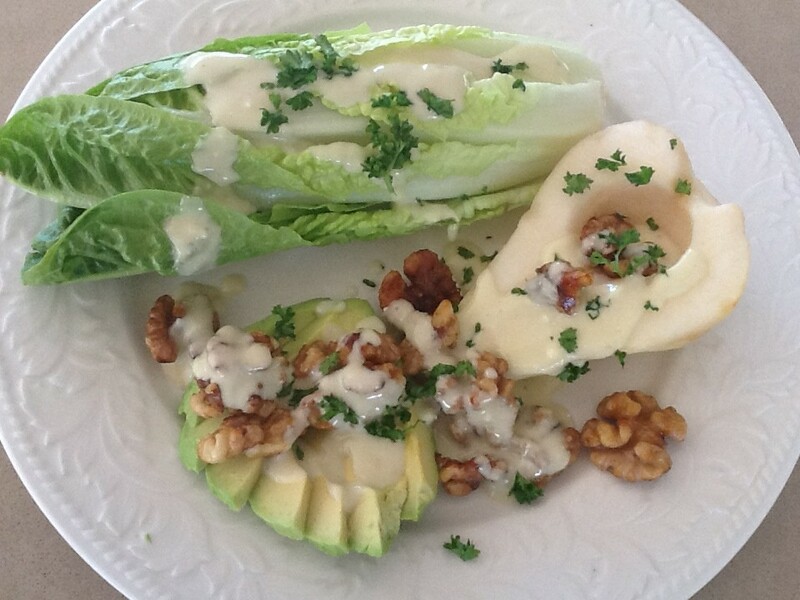 You can use any type of blue cheese and pecans instead of walnuts. Arrange lettuce on two plates. Peel and halve pear and remove core with a melon baller, arrange on plate. Peel avocado, remove stone, cut each half into slices but not quite to the narrow end, then fan out on the plate. Heat oil and cook walnuts for a minute or two, stirring. Add honey and continue to cook and stir until sticky and glazed then turn off the heat – be careful, they burn easily. Place all ingredients for dressing in food processor and process until smooth. Start with 2 Tbs cheese, then taste and see if it needs more. Drizzle some of the dressing over the salads, sprinkle with walnut halves and herbs. Last year the American supermarket chain Costco opened stores in Sydney, Melbourne and Canberra. It costs $60 for an annual membership, but it’s well worth it. A good addition to the Canberra shopping scene. Some people are put off joining, because they think they’re going to have to buy huge quantities of everything, which is not the case. You do however have to buy a kilo of most fresh things, such as meat and cheese. You can buy almost anything in Costco, from diamond rings to car tyres. However, someone told me there are two things they aren’t allowed to sell in Australia which they sell in the USA – coffins and guns. I’m not sure if this is true, but it makes a good story! About a month ago I wanted to make a pear, walnut and blue cheese quiche and remembered having seen a kilo of Italian Gorgonzola for under $16 at Costco, which is much cheaper than anywhere else. Now a kilo of blue cheese is rather a lot for two people, but I reckoned at that price it wouldn’t be the end of the world if I ended up throwing some out. However, to be honest my War Mentality, inherited from my mother, means I don’t throw food away unless I really have to. We have a compost heap and I often wish I kept chickens, then I wouldn’t have to throw anything away. Located near Canberra airport, it’s also a long way to go to buy a kilo of Gorgonzola, but of course I ended up buying a few more things. My brother David who lives in Vancouver, and first introduced me to Costco over there, calls it the $100 shop, because it’s impossible to get out without spending at least $100. The quiche was delicious and over the past month we’ve continued to eat our way through the Gorgonzola – with crackers, in a broccoli and blue cheese soup, in a dip mixed with cream cheese and chopped walnuts, but there was still about half a kilo left! Last week my friend Marilyn took me for a delicious lunch at Flint in the Vines in Murrumbateman, just outside Canberra. 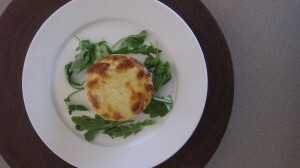 Inspired by their twice-baked goat’s cheese soufflé I came up with this dish. It’s something you could make at the weekend (up to the first baking stage) and keep in the fridge to whip out and serve during the week as a light supper. 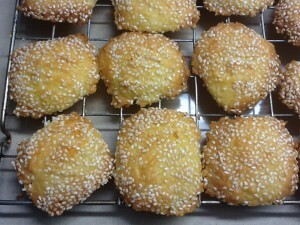 Set oven to 180°C and oil 8 half cup or 4 one cup souffle dishes. Place them in a baking tray or dish you can use as a bain marie. In a non-stick pan heat butter and when melted add flour. Stir for 2-3 minutes until the flour is cooked but not coloured, then gradually add the milk, mixing to incorporate before you add more. When sauce is thick and smooth add nutmeg, cheese and season to taste. Remove pan from heat and add the egg yolks one by one, placing the whites in a large mixing bowl. Beat the whites until soft peaks form, using electric beaters. Add some of the cheese sauce to the whites and mix well, then add the rest and mix thoroughly using a plastic spatula. Divide mixture between the soufflé dishes and pour boiling water into the baking dish to come halfway up them. Bake for about 15 minutes or until risen and light golden brown. The larger sized dishes will take about 20-25 mins. If liked serve the souffles immediately and skip stage two. But if you’re going to do the twice-baked method, remove souffles from the oven and leave to cool then refrigerate, covered till serving time – up to 2-3 days. To serve set oven to 200°C. Line a biscuit/cookie tray with baking paper. Run a knife round each souffle to loosen, then tip them out and arrange them all, or as many as you want to serve, on the paper with a space between each. Pour a little cream over each soufflé, then bake for 15 minutes, or until puffed and golden. Big ones will taker longer than small ones. Remove with a fish slice to serving plates and garnish with the salad. A few pecan nuts, quickly caramelised in a frying pan with a drop of honey or maple syrup, are a nice addition to the rocket salad.